The TEST=EXACT option in the ONESAMPLEFREQ statement specifies the exact binomial test, and the missing value (.) for the POWER= option indicates power as the result parameter. The PLOTONLY option in the PROC POWER statement disables nongraphical output. The PLOT statement with X=N requests a plot with sample size on the X axis. 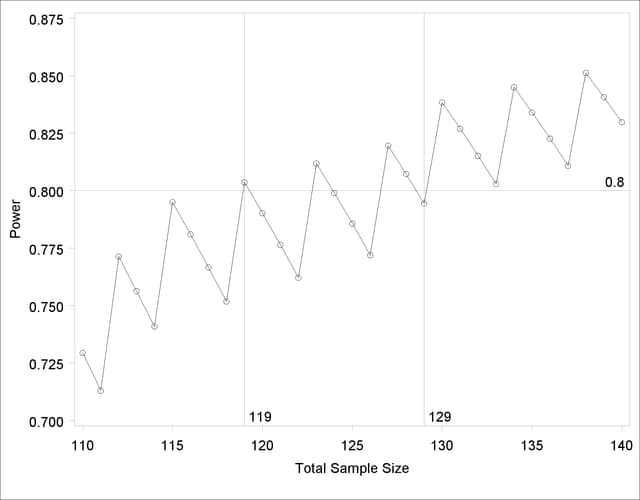 The MIN= and MAX= options in the PLOT statement specify the sample size range. 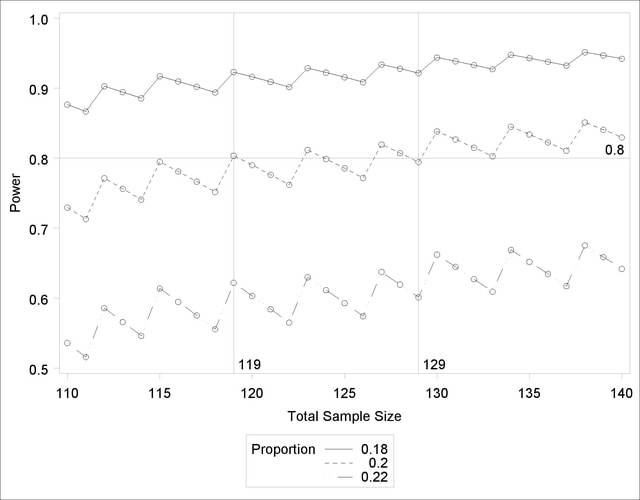 The YOPTS=(REF=) and XOPTS=(REF=) options add reference lines to highlight the approximate sample size results. 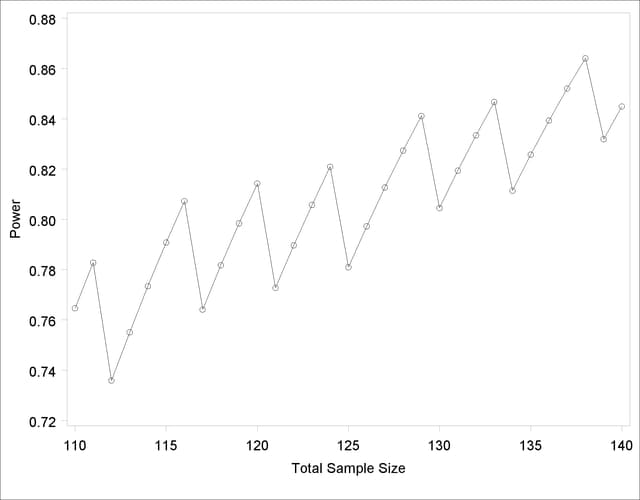 The STEP=1 option produces a point at each integer sample size. 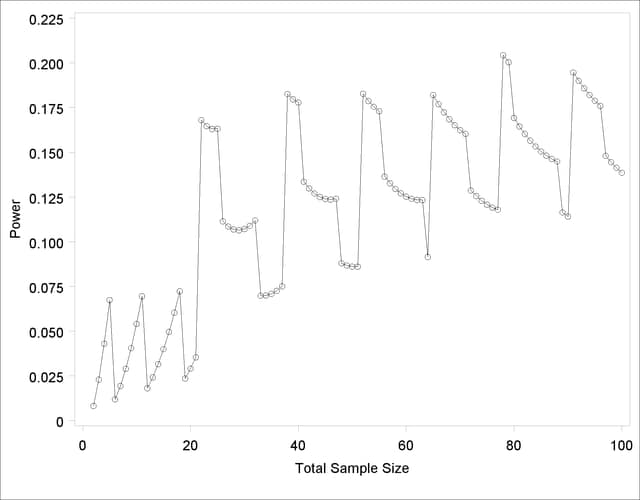 The sample size value specified with the NTOTAL= option in the ONESAMPLEFREQ statement is overridden by the MIN= and MAX= options in the PLOT statement. Output 68.2.3 shows the resulting plot. Note the sawtooth pattern in Output 68.2.3. Although the power surpasses the target level of 0.8 at =119, it decreases to 0.79 with =120 and further to 0.76 with =122 before rising again to 0.81 with =123. Not until =130 does the power stay above the 0.8 target. Thus, a more conservative sample size recommendation of 130 might be appropriate, depending on the precise goals of the sample size determination. Output 68.2.4 shows the resulting plot. Output 68.2.5 shows the plot data. The resulting plot is shown in Output 68.2.6. Output 68.2.7 shows the resulting plot.